What a week here in Texas! Our thoughts and prayers are with all the people in Corpus Christi, Houston and the surrounding areas. It’s a heartbreaking situation, and if you are interested in helping, it will be a long and expensive process, so now is the time to jump in with a donation or work out a way go in person and help. You can donate through this YouCaring site that J.J. Watt started and has already raised over $20 million, but the recovery will be long and expensive, so a donation now will help when later many people forget about the efforts that will take months or years. All the news about the storms reminded me about something we talk about in our Facilitator Training as we explain what is happening at the core of what we do. In a very different way we all face storms in our life. Teenagers are especially susceptible to intense, potentially life changing storms. These life interruptions can make or break a teenager and their future. A few years ago, I wrote a blog post on the specifics about how we can think about this considering how buffalo and cattle handle the storms that blow over the Rockies. Each handling it in their own way. This came from Rory Vaden’s book Take The Stairs. I have continued using this analogy since reading the book years ago. Today though I wanted to take this idea further. 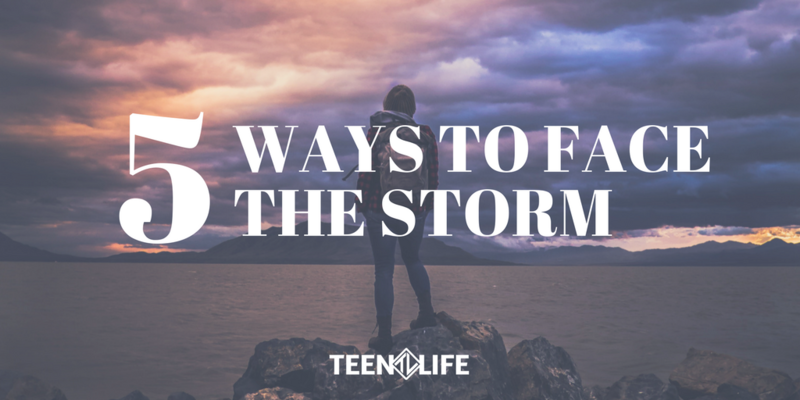 The 5 parts to facing a storm in life are foundational principles that will help any teenager form a perspective that will give them the courage to face the challenges they encounter. Preparing yourself is often something we feel we should do after we take care of everyone else. For a teenager, this preparation can be anything from learning an effective mental exercise, to a list of resources in their phone, to prioritizing who they would call first, second and third in an emergency. When we face hardships, our natural reaction is to work quickly to remove them. The truth is the quickest and easiest way to handle a difficulty is to know what to do when it happens. Any of these are relevant approaches, but you know what prepares them the most? Their mental preparation. We do not enjoy thinking about the worst case scenario, but when we take the time to do this, we gain the benefit of feeling we would be able to handle something tough if it comes our way. The bottom line is we handle it best when we are prepared. Modeling is an opportunity to show a teenager how to stay calm and collected through a life storm. In the buffalo example, the young ones know what to do becuase they watch how the older ones take action when the storms begin to approach. We can do the same. I have learned from years of working with teens that many of us parents try to only do this ourselves. The truth is you need to intentionally involve other adults you trust in your teen’s life so that they will have multiple respected adults to watch and talk to about what is happening. They will likely never share everything with one adult, especially if their only option is you as their parent. I prefer to say confidence because courage can sometimes sound like “sucking it up”. But “Attack with Confidence” sends the message that I am prepared, resourced and intentionally moving toward the situation because I believe I have what it takes to handle it. Since our natural tendency is to remove all pain, it is counter intuitive to think that you could be in an offensive position when you have an unexpected pain point. But it really is true. Consider what you have faced before, think about how it made you stronger and move forward expecting to learn something once again that will help you face the next challenge. We can never remove the stress from life, but we can believe we have what it takes to make it through. I touched on this above, but it is much deeper than that. Did you know that the thing that makes people the most happy is being with other people? I heard last weekend that a study showed that people who were not in community but joined a group of some kind cut their odds of dying in the next year in half! In half! That is worth it right there. But there are more benefits. For about 3 years, I was in a group of other directors of nonprofit programs. I learned a ton from these people both about what to do and what not to do. Our group helped make me and our organization better even though they didn’t have any direct impact on decisions made in our organization. Here’s the key though, be sure you include people different than you in your community. It will help stretch you and help you see how drastically varied perspectives can be. Often you may find that things in your life aren’t really so bad and the hard work you are putting in is worth what you get out of it. Once you have gotten through a difficult time, it is important to recognize, if only in a small way, that you made it. Your family can set the tradition here. You decide how things get celebrated. The point in this is to put emphasis on the fact that you survived. No one is saying you have to survive a certain way or have to look tougher on the other side, just make it through. Then as you draw on the strength that got you through, you will be able to pull yourself together and continue to grow into the new you. By seeing every situation you face as a chance to grow, to learn, to become more self-aware and others-focused, you can celebrate more on the other side because you will feel accomplished rather than beat down each time you survive what life throws at you. What do you think? Do you have examples of times you have survived and how it made you better? Share them with us or at least share them with someone close to you so it can help them have a different perspective too.